My eight year old son, Adam is passionate about art. He can often be found surrounded by his paints and sketch pads and has even expressed an interest in taking art lessons. I love to encourage his gifts and was very excited to discover a new treasure, CheriArt. CheriArt is a new art and craft company geared towards kids and adults of all ages. It offers a wide selection of the highest quality DIY art kits that include preprinted canvases, paints, brushes, aprons and instructions (printed or DVD) so that you can create your own works of art. 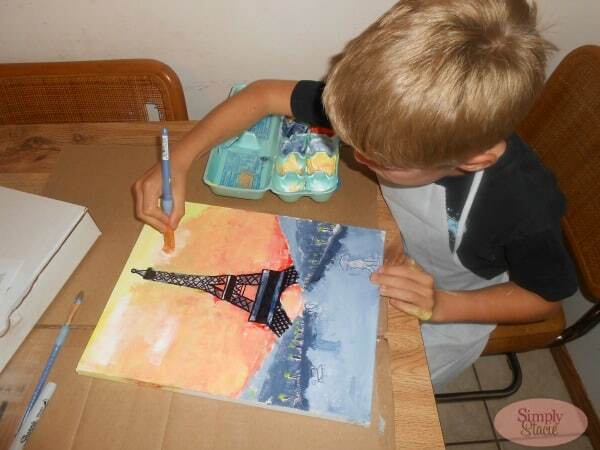 CheriArt kits are designed to be versatile so you can do it yourself at home, with the kids or even as a home art party. 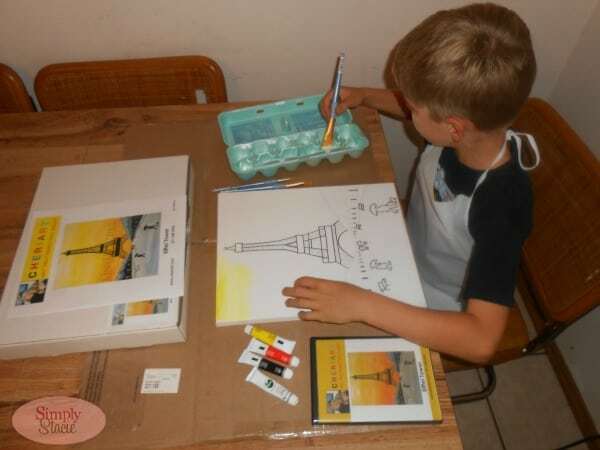 Adam was beaming when he was presented with the Eiffel Tower Art Kit ($60) and I was so impressed with the quality and content of this kit which far exceeded my expectations. 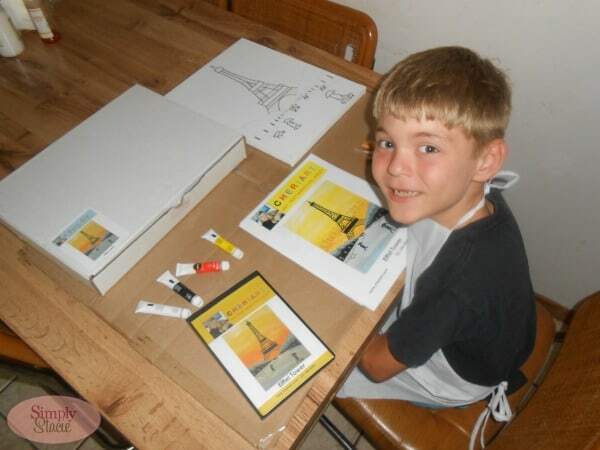 Before starting his art project Adam and I watched the instructional DVD that was included in this art kit which taught him valuable new art skills and we loved the warm, friendly tutorial by art teacher, Cheri. Adam devoted many hours to creating his masterpiece working on it at his own pace. He often referenced the instructional DVD which helped him learn how to create the sky and details in the picture. He even got creative and added his own personal touches such as extra people that he painted in himself on the preprinted canvas. 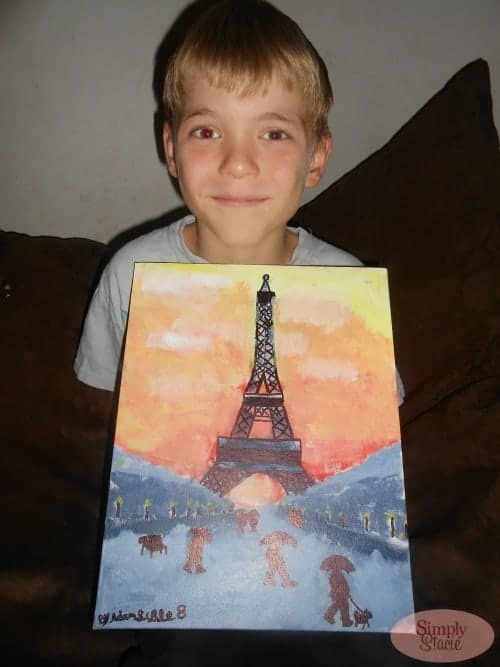 Considering that this kit is considered a more advanced adult kit, we were extremely proud of his finished work of art that now hangs in his room to be treasured for years to come. The DIY art kits for kids are adorable…..check out this cute Happy Tree Frog ($37) which includes six tubes of paint, one flat brush, one filbert brush, one 8×10” canvas with image, an apron and written instructions. The kid’s art kits would be the perfect idea for a child’s birthday party theme and it was also a big hit with my children. I was so impressed with the CheriArt art kits that I purchased the Cheri’s Red Poppy ($75) art kit for Adam because it really hit home personally for me. My mother passed away in childbirth with me and was also passionate about art from a young age. One of the items that I inherited from her was a painting of a Red Poppy that she had done when she was only thirteen years old. I plan to give the Cheri’s Red Poppy to Adam on his 9th birthday so that he can recreate a painting similar to that of his biological grandmother that he never met but who likely passed along her passion and gift for the arts. You are invited to visit CheriArt to browse the entire selection of beautiful DIY art kits…..if you love dogs, check out the Pick Your Puppy kits! With the holidays just around the corner, these art kits would make wonderful gift ideas for art lovers. If you have wanted to take art lessons or learn how to paint then this is a wonderful and affordable way to create your own masterpieces in the comfort of your own home. CheriArt even has a direct sales opportunity and they are looking for CheriArt Consultants. You can host professional parties and earn commission while being your own boss and working your own flexible hours. If you are interested in learning more about this opportunity you can contact Cheri and her team via their website or phone number (found on the website). I like the Great Dane one. I love the Regal Peacock! I like the Poppies at Twilight. I love the A Girl Needs Shoes kit. So many to love, but Poppies at Twilight looks amazing. Adam did a great job on that one up there! I like the Pick Your Pet!